If you’re reading this article, congratulations are in order: you’re about to count another year with an awesome lady, or maybe your first year. It’s a great feeling, and an important milestone, so you want an anniversary gift to be special: it should suit her and be appropriate to the occasion, maybe representing a year. We can certainly understand wanting to do your research and field all your options. 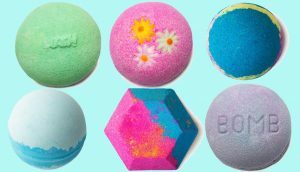 Here’s a list of 30 unique, special, personal anniversary gift ideas for your girl. Traditionally, the first wedding anniversary calls for gifts made of paper. Whether or not you’re married, paper is an interesting starting point, and yields a lot of cute ideas. 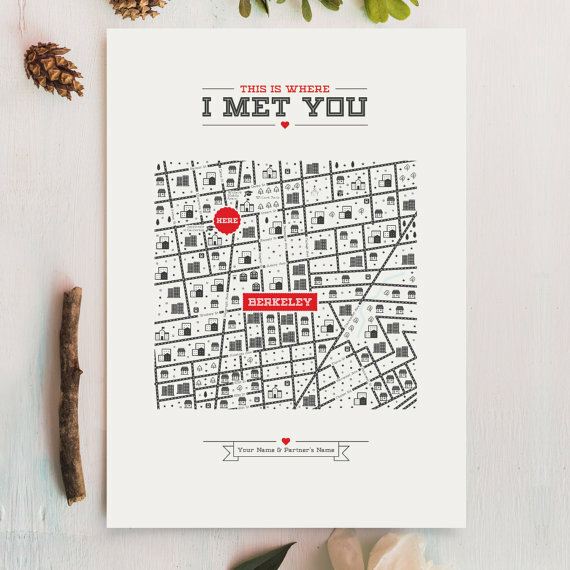 This personalized map is a pretty bit of graphic design that commemorates where you and your lady first met. So if you’re looking for wedding anniversary gifts for her, this one is a great choice! 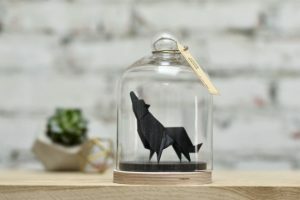 Another one for the paper anniversary, this very fancy origami wolf in a glass and wood case would be beautiful on a bookshelf or nightstand. You can have add a handwritten tag on top of the bell, choose the color of the animals, or pick a different animal altogether from the other options in this artist’s store. If she likes jewelry you can buy her this gorgeous origami wolf necklace. 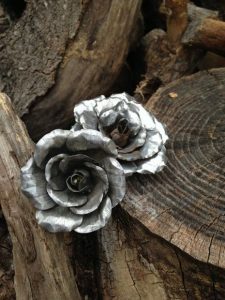 Would you ever even guess these were paper? If you’re looking for one year anniversary gifts for her, these amazing, tiny, handmade flowers are the centerpiece of this pretty pendant. It’s cute and symbolic, but not too intense, so perfect for your first year together. 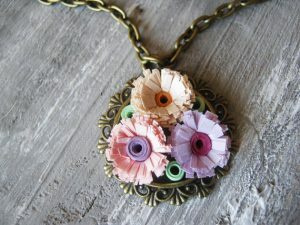 Find more paper necklace here. If you’ve only been together a year, this might be a great “wish list” of places you’d love to take your girl. 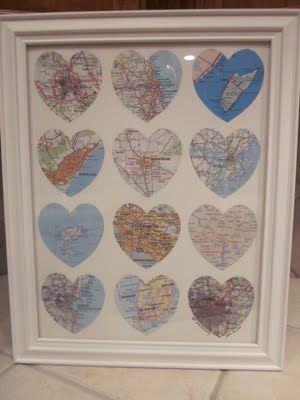 If you’ve been together longer or are especially adventurous, fill up all those hearts with the places you’ve gone together. Rustic is totally an aesthetic, and this is cute anyway. You need minimal artistic skill to pull off this DIY gift, and the stuff you choose to put in it shows her that you know her. 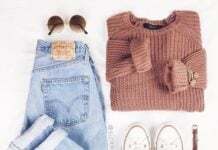 Stash practical items like travel-size versions of her favorite hand lotion or lip balm, and gift cards to her go-to lunch and coffee spots for busy weeks. Include a few of her favorite “splurge” items that she loves but won’t always buy for herself. This one requires some planning, and if you’re tight on time, make it 52 notes so she has one a week. The goal is to make her feel special and represent an entire year together. Personalize this in whatever way suits her and your relationship best. So you thought about getting your girl flowers, but she’s sort of a hippie type and isn’t into cut flowers. 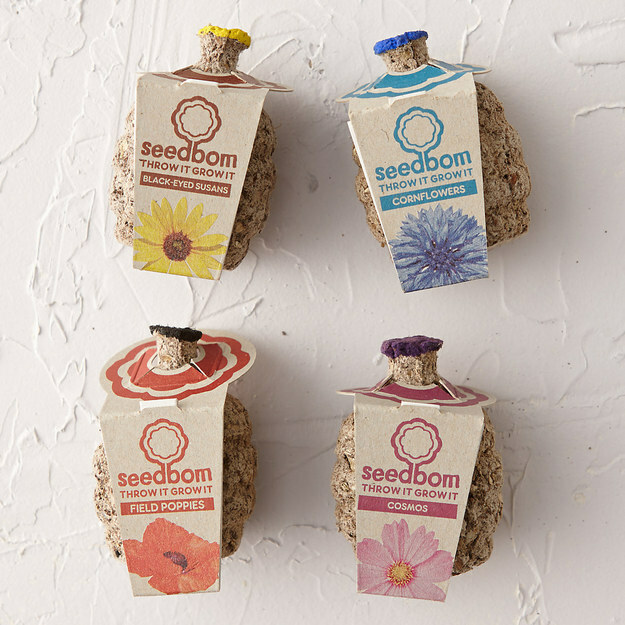 Here’s the perfect solution and a step above:flower seed bombs. You still get gorgeous flowers out of the deal, but this is more special because you get to watch them grow, which also suggests looking forward to many more years together. 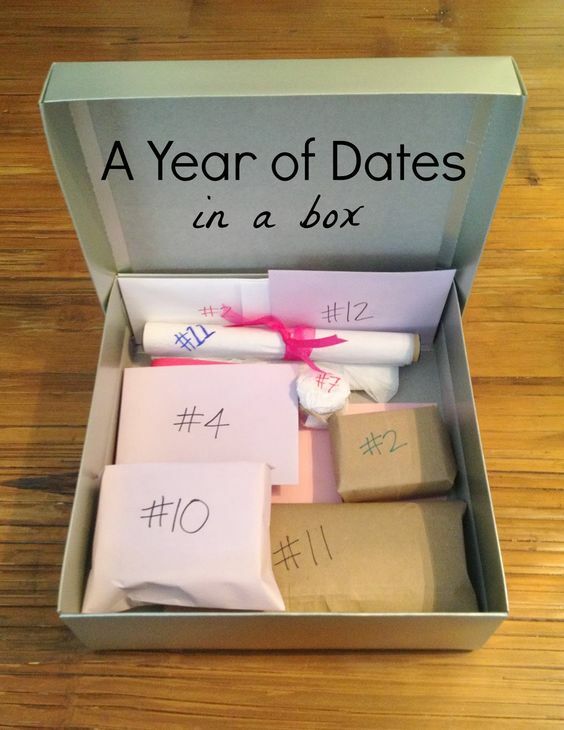 Fill a box, jar, or journal with one special, pre-planned date per month. 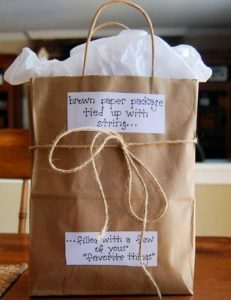 Write out the details and wrap up any supplies you can get in advance. 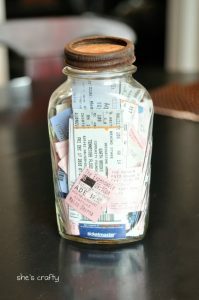 Get creative with presentation and what constitutes a date, and try to make everything seasonally appropriate to each month. 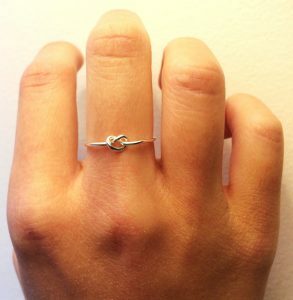 If she likes jewelries, this knot ring is one of the best anniversary gifts for her! This ring is subtly romantic, and because it’s so small and simple, she can wear it and look at it every day. Does anyone still have a lucky penny? Probably not. So, get her a personalized one from the year you got together. If she’s the beauty type, Birchbox can’t be beat. They’ll send one box per month filled with samples and info of all types of beauty products. Then, when she finds her new favorite, you’ll know what to get her later. If she’s NOT the beauty type, this one might be a better subscription box. 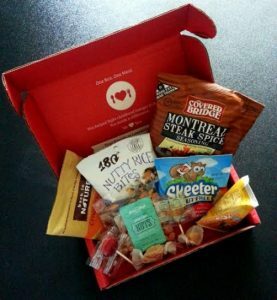 Love With Food delivers lots of organic, all-natural snacks once a month, and they support hunger charities with their proceeds. Delicious AND doing good, all year round. 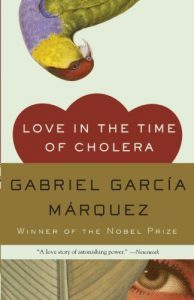 If she’s a literature major, you’ll score big with a book. That said, if she has refined tastes, you can’t go with any old romance novel and call it a day. 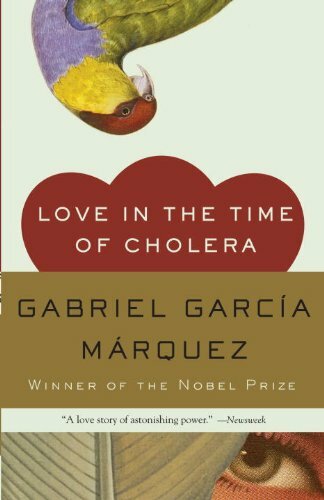 Love In the Time of Cholera by Gabriel Garcia Marquez is an epic, magical-realism love story that will sweep her off her feet. Okay, I’m not talking about some drab terrycloth number from a home goods store. I’m talking about a classy, grown woman number that will make her feel like a million bucks after she gets out of that luxurious bath. Yes, you can go a little sultry on this. But the item should still be cozy and functional. After all, the gift is to make her feel special, not to make her look pretty for you. You will have to put some work and craftiness into this, but the result is adorable. Write something special on each of fifty-two cards, drill a hole, and present them on a ring. 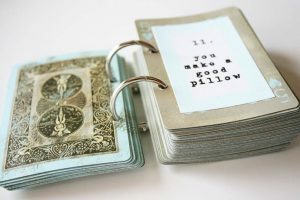 She can stash this in her desk or nightstand and look at it whenever her boss is on her case or she’s just come home from a bad day. Your lady wants cute pictures of you two. She really, really does. 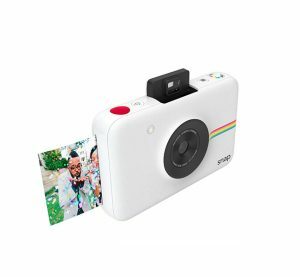 This little gadget from Polaroid prints photos instantly and has an available memory card so you can keep and share digital copies. 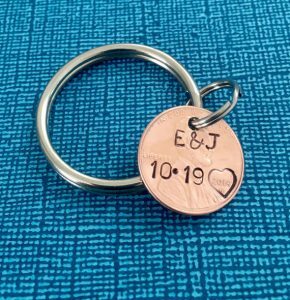 Whether this is your 5 year anniversary, 10 year anniversary or 30th anniversary, a customized bar jewelry gift is always romantic! These are super simple and customizable with names, dates, quotes, or any text you can think of. They’re pretty and dainty, but unassuming enough to wear with anything. 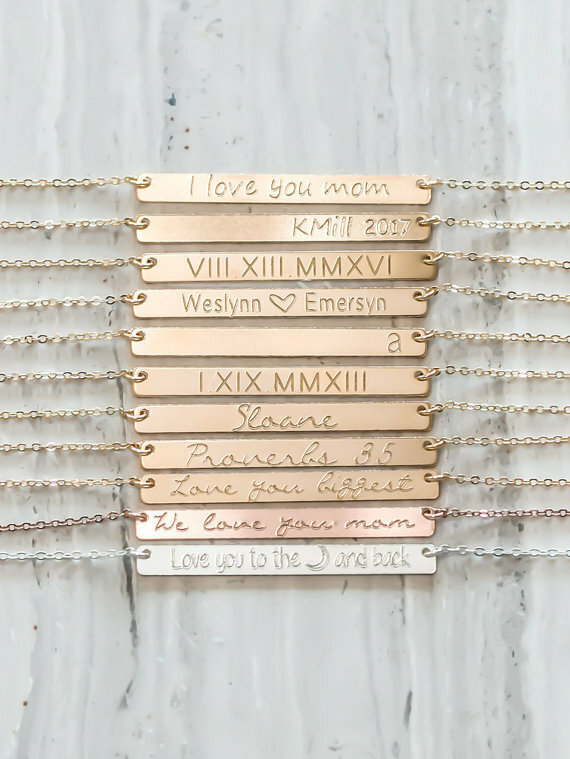 If you get her jewelry for your anniversary, you’ll want it to be something she keeps around all the time. Perfect if you like to cook together, and even better if you’re planning to move in together. 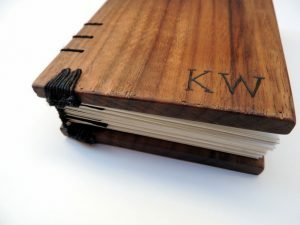 Get a beautiful, customized recipe book for all your kitchen successes, and it will last a long time and stash memories as well as recipes. Simple infinity jewelry is always a win. This has enough detail to be striking but is subtle enough to be timeless and elegant. 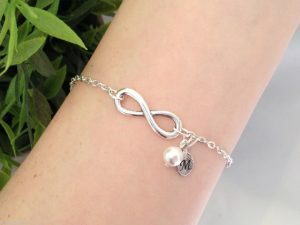 The infinity symbol represents your love and the years you hope to spend together, of course. For when you’re confident you’re in it for the long haul, and never want things to get dull. 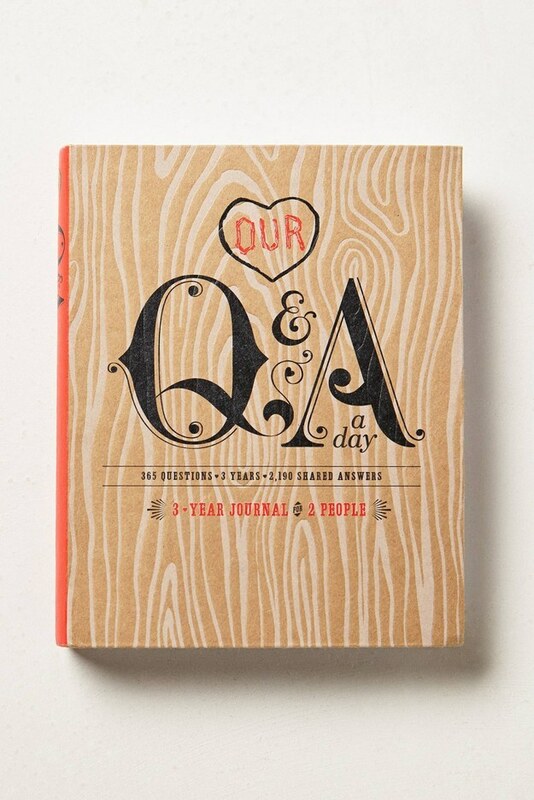 This journal is filled with thought-provoking questions for both of you to answer. 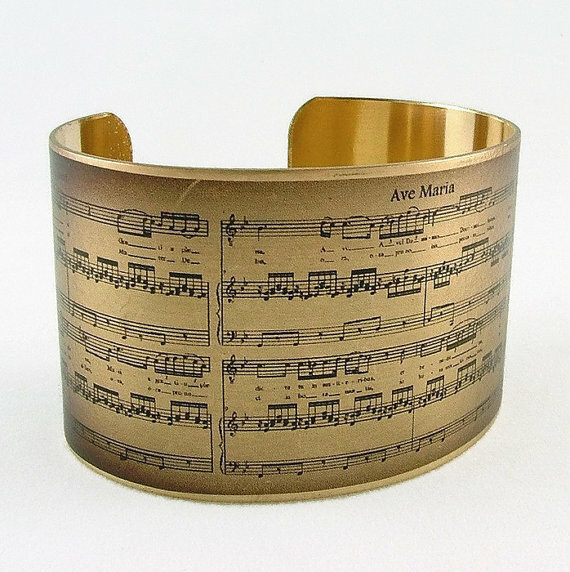 This one has the music of Schubert’s Ave Maria but any piece of music can be printed or embossed on a cuff. If she’s into the classics, great. If not, get “your song” printed on one instead. 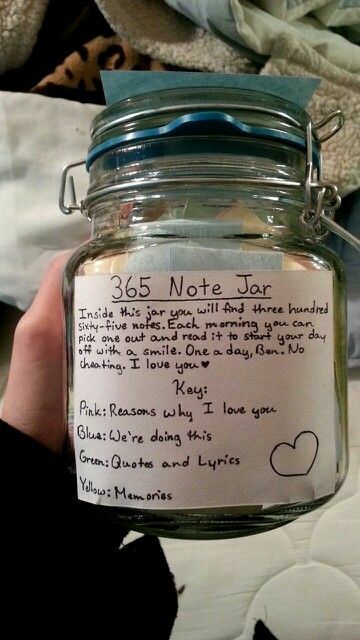 Start this before your anniversary. 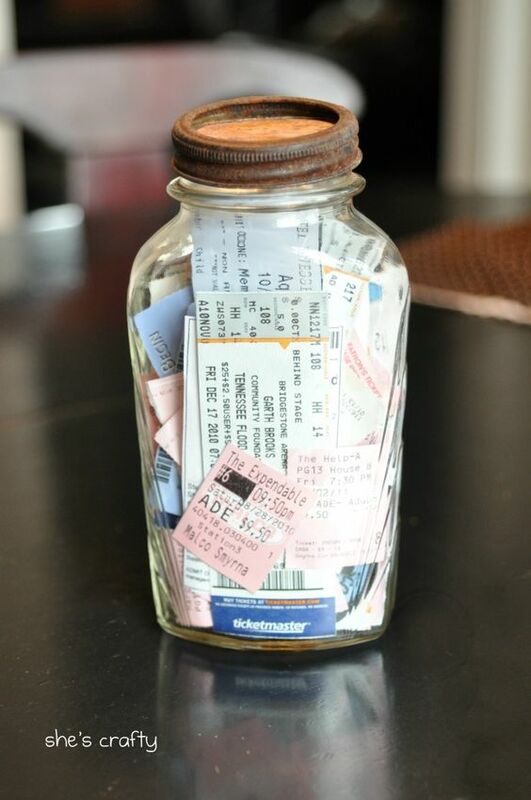 Stash ticket stubs and other small mementos of all the stuff you’ve done together. Present it to her as something you want to fill up again and again and again. 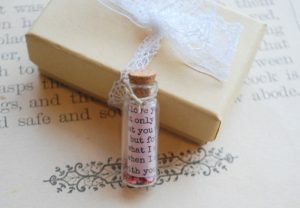 Girls like to see thought in a gift, AND they like to see that you didn’t come up with it last minute. This will definitely show her both. 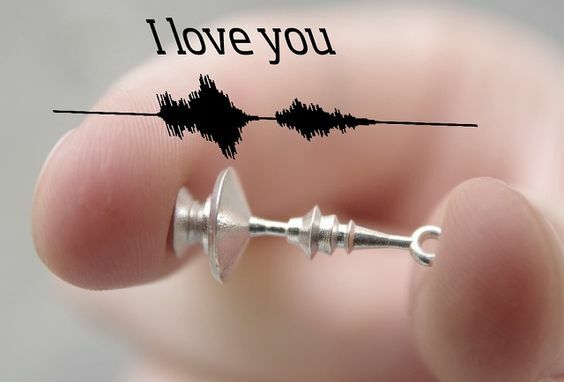 Keep it simple with, “I love you,” or use a snippet of your song, or a recording of you calling her by that embarrassing pet name she would hate for anyone else to know about. This can be put on a chain as a necklace, and it looks cool and modern. Only she will know the true meaning behind it. Chemistry nerds need love too! 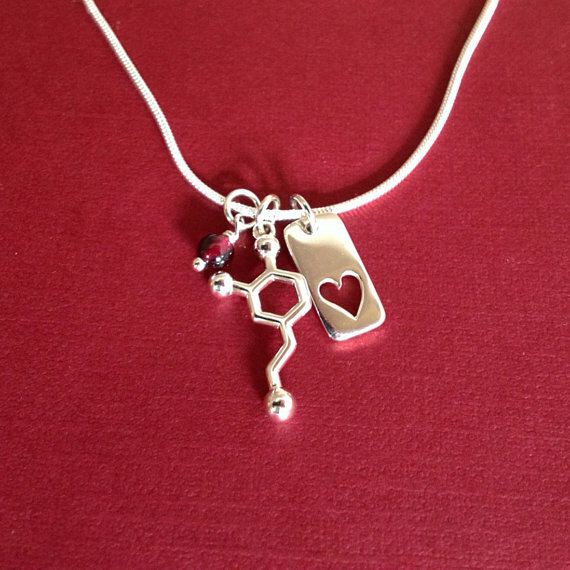 If your girl has a big brain AND style, she’ll appreciate this nerdy necklace. Dopamine is the stuff that saturates our brain when we feel love, and this silver dopamine molecule is paired with a simple red bead and a heart charm. Roses are classic, but they also might be too easy and thoughtless. So, how to take advantage of such a recognizable symbol of love and romance without seeming cliche? Metal roses, I repeat, METAL ROSES. Perfect for the toughest, coolest girl you know: your girlfriend. Chocolate is another classic that runs the risk of being cliche. Luckily, you can buy embossed or printed chocolates with patterns, pictures, initials, and more, beautifully presented and still delicious. Some companies are even offering 3D printed chocolate nowadays. There’s absolutely no excuse to buy a heart-shaped box of truffles instead of one of these options. Remember, anyone can buy chocolate at the store. 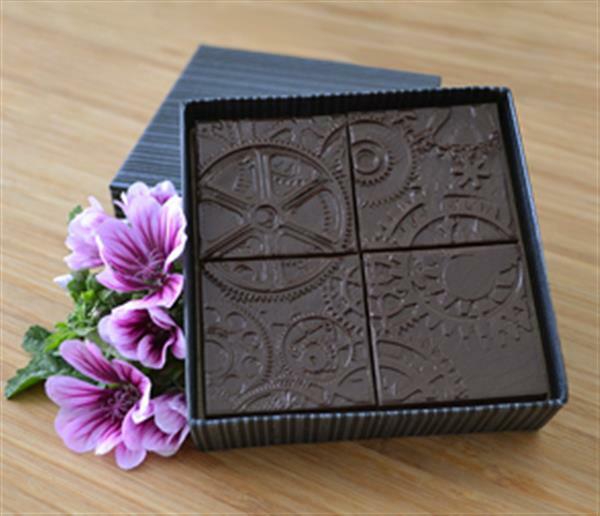 Getting customized chocolate shows you put time and thought into the gift. So, this is cool anyway, and yeah, you could just do her zodiac sign, but I’m about to take this to the next level for you. The constellations visible in the night sky vary depending on time of year and your specific location. There are loads of astronomy websites that can assist you in figuring out what was showing big and bright in the night sky when and where you met or went on your first date. Figure that out, and do THAT constellation. 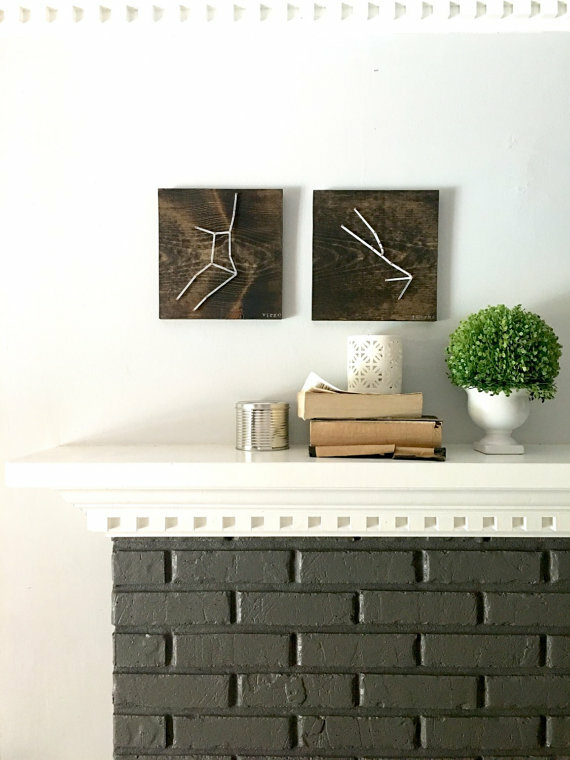 This is an easy DIY project if you’re even the slightest bit handy: print-out of constellation, piece of wood, nails, hammer, string, done! This can be both a planner and a scrapbook for all the stuff you want to do together: learning new things, traveling, having new experiences, and more. 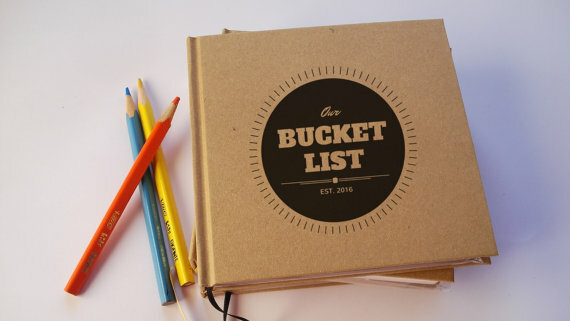 Fill it up with your ideas first, then document what happens, year after year. You might be game to do this yourself, or you can buy one custom made. This can be an ornament, necklace, keychain, or just a tiny little thing that hides on her desk or in her bedroom for her own private enjoyment. On the paper, write anything you want, but make it personal: a quote from her favorite book or a message from you are good choices. 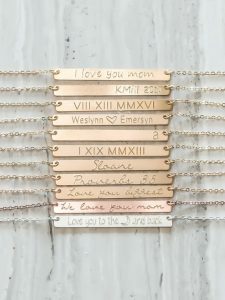 We hope you have found the right anniversary gift for your special girl in this list of anniversary gift ideas for her!